For those of us in the diabetes community, the title says it all--Blue Candles. 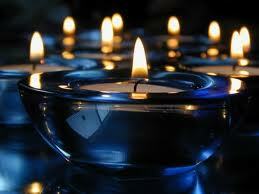 They are the candles that we light in cyberspace to remember someone with diabetes who has lost the fight. Each month, each week, we seem to see these images pop up across the online community. As profile pictures are changed on Facebook stories emerge, fears grow and the desire for a cure is that much stronger. This time the candles are being lit for a bright, young fourteen year old girl. She was diagnosed when she was four years old. She laid down for a nap and her father found her dead on her bed a few hours later. The story sends chills down my spine. She did not die at night. She passed away sometime during the afternoon. We do not know many of the details. We only know that she was far too young to die. I don't tell my son about these stories any more. He is almost the same age and has had diabetes for a few years more than she did. I don't light candles on my Facebook profile. I don't write about half of the stories that I hear. I can't. I read about these children--whether they are fourteen or forty, they are still someones children. My heart breaks for the parents and the families. I hug my boys a little closer. I pray a little harder. I hope for the very best. I was reading a story one day of another child lost and of course had teared up a little. Someone told me that many children sadly die each day. It could be a complication from cancer or an asthma attack but other diseases kill as well. It was suggested that I can't focus on these deaths and be obsessed or paranoid. I reassured this person that I wasn't. I read. I mourn. My heart aches for the families and I grieve for the life cut short before its time. It is true that our children die crossing the street, riding in cars and playing in swimming pools. As parents, we do our very best to protect them. We teach them to look both ways before crossing the street. We put them in car seats and demand that they were seat belts. We teach them water safety and we warn them about the dangers of drugs and alcohol. All in all we do our very best to guide them and pray that they will be okay. As parents of children with diabetes, we do all of that "normal" stuff and then we do a little more. We work to help them to recognize highs and lows. We test them as often as we can. We keep tight control to prevent complications and fear going too far and having to wake to a child gone because of a low. These fears are real. They do not keep me up all night but they do wake me up at 2am to test. They do not stop me from letting my son be a child but it does make me check his pockets for glucose and his cell phone when he goes out. As a parent, I cannot protect either of my children 24/7 for the rest of their lives. I wish I could. As much as I love watching them grow, think and spread their wings, part of me craves for the days past when I held them tight and could keep them safe in my arms. They are growing. My oldest son is driving and almost out of school. My youngest is well into his teen aged years and venturing off on his own more and more. Diabetes or not, I can only pray I have done my best, continue to do as much as I can and leave the rest up to a higher power. Last night was my son's first night home after a few weeks away. I went to bed and woke a few hours later than I had planned to but he was low. The story of young Carson played itself out in the back of my head. After 45 minutes and a lot of juice, his blood glucose levels were back in range and I could return to bed. I said a prayer of thanks that I woke up to test him. I prayed for Carson's family. I touched my son's hair and wanted to hold him tight and kiss him gently on the forehead like I used to when he was small. He is now a teen. If I did anything beyond quietly touch his hair he would wake up creeped out and would claim nightmares for the rest of the night! Instead, I watched him sleep and I thanked God that he was alive, healthy and happy. I will test my son at all hours. I will remind him to bolus. I will deal with late night lows. I will demand to know where he is going when he leaves the house. I will preach the evils of smoking, drug use and the dangers of too much alcohol. That is my job and I need to know that when I close my eyes I have done that job to the best of my ability. This will never guarantee the 100% safety of either of my boys but its my very best and that is all a parent can ever do. Mother of two...one with Type One diabetes. 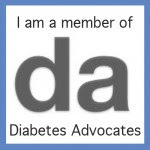 Founder of www.diabetesadvocacy.com, advocate, Life Coach, blogger, facilitator, and much more! Blackberry? iPhone? Vibe or Veo? Does Diabetes Effect your sleep? What sleep? Imaginary Friends? No they are Family!